Detail of armorial panel over entrance. View of entrance facade with excavation in foreground. (Old) House of Fetternear, from c.1566. The massive footings of the palace, built by Bishop Ramsay of Aberdeen in 1226 and extended by Bishop Kyninmond, 1330, are still visible in front of the old house. The lands remained with the bishops until 1550 when a lease, which rapidly became a gift, was granted to John Leslie, eighth Baron Balquhain. They retain a timeless feel. Oldest part is three-storey tower with circular south-west angle tower and vaulted ground floor. comparison. 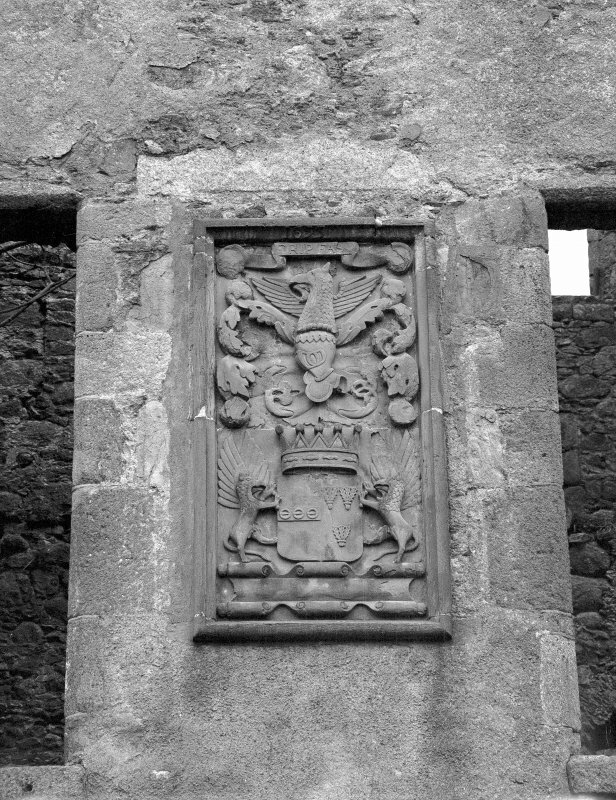 Important 1693 armorial panel over central door incorporating Leslie's coronet of a Count of the Holy Roman Empire, above which is stone carved with sacred monograms (IHS, MRA), part of cult of Holy Name indicating Leslie's adherence to the Counter- Reformation. wing in 1850. Burnt out 1919). For (successor) Fetternear House (NJ 7226 1722), see NJ71NW 7.00. For successive excavation reports see NJ71NW 7.11. Of the old Palace, Tower and Fortalice of Fetternear, little now remains, except some foundations of what appears to be a small L-planned tower (noted as Fortress of Fetternear on OS 6" map) slightly S of the present house, known locally as the "Auld Founds" and said to be part of it. The walls show no trace of mortar and are up to 3.5m in width (Kelly 1909). It would seem to have been in existence prior to 1256, when there is a tradition that Peter de Ramsey, Bishop of Aberdeen, made additions to it. This building, and not the Wallace Tower in the new house must have been where Sir William Wallace lay concealed when, by tradition, he was at Fetternear in 1297. Further alterations were made in the 1330s by Bishop Kyninmund, who completed Fetternear and used it as his summer home from 1329-1341. The remains of this were partly uncovered towards the end of the 19th century. By 1550, the Palace had become so ruinous as to be no longer habitable, and when, in 1566, William Leslie came into possession of the Barony, he built Fetternear House from the material available on the site. The original small tower house forms the SE part of the present building. The first additions were made in 1690-1693, the latter date being carved above the doorway in the S wall, and further additions and alterations were made in 1818-9 and 1841-4. The House was burned in 1919, and now stands three storeys high and roofless. The ruins are in an extremely dangerous condition, with sections of the walls in imminent danger of collapse, and the lower floors are cumbered with a heavy growth of young trees. Visited by OS (NKB) 16 January 1967. H G Slade 1974; W Kelly 1909. Visited by OS (NKB) 19 August 1976. Early (13th cent.) house with additions in 14th and 17th cents, and later. It is first mentioned in 1256 but is better known as the summer palace of the 13th Bishop, Alexander de Kynimand (1329-41) who made extensive additions to it. The foundations of these extensions were uncovered some years before 1906 when some perfect pieces of advanced first-pointed moulding and tracery in Kildrummy freestone were discovered. In 1549, the house and barony were granted to the Earl of Huntly, and a charter of 1566 mentions the palace, a fortalice and a tower. The building is now a crumbling shell bearing the date 1693 on a plaque above the main entrance in the S wall; there are no indications of an earlier structure. The name Wallace's Tower is not known locally but does not refer to either of the towers, which are both clearly associated with the 17th cent. house. Some 25m S of the house there are the scant remains of an early building, which was excavated (to a depth of 1.8m) many years ago and is incorrectly described as the Fortress of Fetternear on the OS 25" map. The walls show no trace of mortar and are up to 3.5m wide; they are probably the foundations of the Palace of the Bishops of Aberdeen. A copper sundial (by James Villier, 1798) on a granite baluster is in the garden of the new house. Information from Aberdeenshire Archaeological Service, visited 13 April 1994. (Old) House of Fetternear, from c. 1566. The massive footings of the palace built by Bishop Ramsay of Aberdeen in 1226 and extended by Bishop Kyninmond in 1330 are still visible in front of the old house. The lands remained with the bishops until 1550 when a lease, which rapidly became a gift, was granted to John Leslie, eighth Baron Balquhain. They retain a timeless feel. Oldest part is three-storey tower with circular SW angle-tower and vaulted ground floor (to E) built by Leslie on acquiring lands. Extraordinarily elongated mansion (NJ71NW 7.00) tacked on by Count Patrick Leslie, 1691-3; originally a symmetrical three-storey, six-window house with circular angle-towers (that on the E belonging to the original house). A one-window wing was added on the W to balance the original tower. For sheer scale one must look to Fetteresso for comparison. 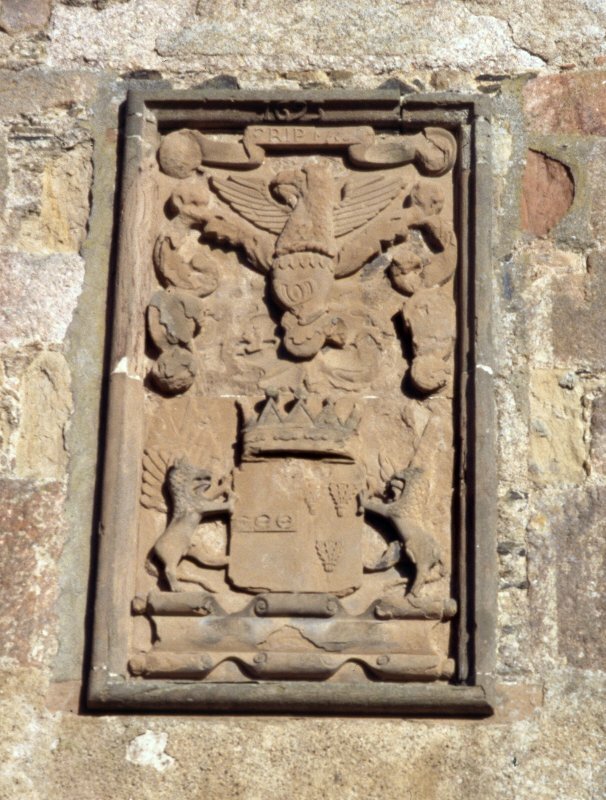 Important 1693 armorial panel over central door incorporating Leslie's coronet of a Count of the Holy Roman Empire, above which is stone carved with sacred monograms (IHS, MRA), part of cult of Holy Name indicating Leslie's adherence to the counter-reformation. The forecourt, with stabling, offices and side wings, was burnt down in 1745 when factor, to whom the estate had been leased was attempting to strip it bare. Gothicised by Massie in early 19th century by raising the towers and adding corbelling and a heavy, crenellated parapet. A two-storey wing with bow was added in 1818 and a two-storey cross wing in 1850. Burnt out 1919. Excellent estate furniture, in particular the huge coped boundary wall and the gryphon-topped gates (NJ71NW 7.04) at Kemnay Bridge. I [A G] Shepherd 1994. (NJ 723 170). The first season of excavation at the summer palace of the Bishops of Aberdeen at Fetternear took place in September 1995. This had been preceded by a resistivity survey of the area immediately S of the ruined mansion. Fieldwork and desk-based research had already shown that this area included the remains of the pre-Reformation Bishop's palace, parts of which had been exposed in 'excavation' in the late 19th century. The resistivity survey indicated that the site retained considerable archaeological potential despite the 19th century exploration. It also seemed to confirm many aspects of the plans of the foundations marked as the 'Fortress of fetternear' recorded on the 1900 2nd edition 1:2500 Ordnance Survey map. Documentary sources suggest that the Bishops of Aberdeen already had a residence at Fetternear by the mid-13th century. This seems to have been extended/rebuilt in the 1330s by Bishop Kyninmund who used it as a summer residence. The 19th century excavation resulted in the detection of 'some perfect pieces of advanced first-pointed mouldings and tracery' which should probably be associated with this rebuilding. A finely-carved granite capital, a surface find, was recovered during earlier excavation, and suggesting that further work was being carried out in c.1500. During the 1995 excavation season, the already exposed foundations were cleaned and recorded (Area A). An area measuring 9m by 35m, to the W of these foundations extending soutwards from the 16th century towerhouse, was opned (Area B). Thus the upper contexts of a total of nearly 500m squared were investigated. The earliest feature within Area A (the 19th century excavation) consisted of a substantial wall c.2m wide; it was shown to extend N towards the mansion. Within Area B it had been cut down to serve as part of a cobbled courtyard immediately to the S of Ftternear House (NJ71NW 7.00). The season's work also demonstrated that the area between the 19th century excavation and the mansion remained substantially undisturbed and that in places organic deposits survive. In adition, the resistivity survey was enlarged to the E of the site, and a contour survey was undertaken. Working in association with the excavation team, surveyors from the RCAHMS undertook a survey of the ruinous mansion; although not yet completed, it has already demonstrated that this building has a much more complex architectural history than previously has been suggested (PSAS 1974). It now appears that a two-and-half storey hall-house was added to the late 16th tower-house, probably in the 17th century. The building was enlarged again at the end of the 17th century, with the construction of the present frontage, which bears the coat of arms of Patrick Leslie, a count of the Holy Roman Empire, and Mary Irvine. Further extensions and alterations were made in the 19th century. During the course of the architectural survey a number of reused stones from the Bishop's Palace were detected. It also appears that the N wall of the 17th century hall-house may have included parts of the pre-Reformation palace. This project forms part of a larger research programme, the Scottish Episcopal Palaces Project (see also entries on Bishop's Loch, Gordon District and Kinneddar, Moray District), one of the purposes of which is to examine the relationship between castellar and ecclesiastical architecture in medieval Scotland. The writers wish to thank Mrs C Whittall, Mrs C Fyffe, Mr R Fyffe and Mr D Fyffe for their support and for allowing access to the site. Sponsors: University of Wales, Lampeter; RCAHMS; British Academy; Grampian Regional Council; University of Aberdeen and the Scottish Castle Survey. P Z Dransart, N Q Bogdan and P Bewers 1995. (NJ 723 170) The second season of excavation at the summer palace of the Bishops of Aberdeen at Fetternear took place over a period of four weeks during July 1996 (Dranzart, Bogdan and Bewers 1995). The excavation team continued recording the standing building and the exposed parts of Charles Leslie's late 19th-century excavation. A start was made on recording the environs of the site. Although the present policies mainly date from the late 18th and early 19th centuries, evidence of a late 17th-century garden was also detected. 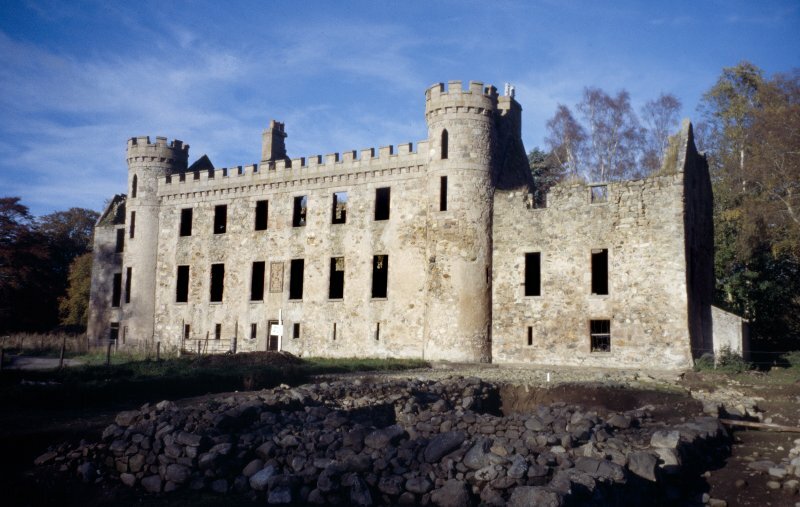 While the 1995 season had concentrated on the ruined mansion, tower house and the area to the S of them, during the second season the clearance of trees and undergrowth allowed the examination of the N wall of the mansion and tower house. From this it appears that parts of the pre-Reformation bishop's palace underlay and extended to the N as well as to the S of the standing structure. Two externally splayed gun-loops of 16th-century date were also detected. They had been inserted into two of the upper floor windows of the late 16th-century tower house, probably in the 1640s when Fetternear was twice besieged by the Covenanters. Amongst the finds recovered during the 1996 season was a cannon ball which probably also dates from this period. The finds recovered already include significant amounts of pottery (both medieval and post-medieval), animal bone, metalwork and glass. Apart from examples of post-medieval vessel and bottle glass, window glass (some of which is probably of medieval date) was also detected. Perhaps significantly the metalwork includes window leading. As yet no trace has been found of the ?perfect pieces of advanced first-pointed mouldings and tracery? that Leslie detected during his late 19th-century excavation (Trans Aberdeen Philos Soc 4 (1910), 172-3). During this second season, the excavation was extended to include an area 19 x 42m. It also became apparent that for a rural site Fetternear is noteworthy for the depth of its stratigraphy. The undisturbed pre-18th-century deposits appear to be at least 1.2m deep. Efforts were also made to identify the outer limits of the site. The first season's contour survey was extended to include the W sector of the site, and a resistivity survey was carried out on the site and its immediate environs. As a result of additional processing of the smaller 1995 resistivity survey, it had become clear that, although there are now no surface indications, the major structures that Charles Leslie detected about a century ago survive; it had previously seemed likely that the W part of these had been destroyed earlier in the 20th century. An interim report on the project is available. Sponsors: University of Wales, Lampeter, Society of Antiquaries of London, Society of Antiquaries of Scotland, Aberdeenshire Council, Aberdeen University, Scottish Castle Survey, W Strachan, Sir Archibald Grant. P Z Dransart and N Q Bogdan 1996. (NJ 723 170) In the third excavation season in June and July 1997 at the summer palace of the Bishops of Aberdeen at Fetternear (Dransart and Bogdan 1996) virtually all of the modern contexts, as well as contexts contaminated by the late 19th century excavation, were removed within Areas A-C. In parts of Area B slight evidence of plough damage was detected. The stratigraphy of walls exposed in the course of the 19th-century excavation reveals a complicated sequence. Most of the 19th-century excavation had been backfilled, apart from Area A. This was apparently left as an archaeological feature in the lawn in front of the mansion, and the evidence indicates that part of it was converted into a flower bed. A garderobe was identified in Area A; it appears to have been erected above an earlier structure. Its outflow, which has not yet been excavated, seems to flow into a ditch infilled with building rubble at the time the tower house was erected later in the 16th century. The ditch infill contained medieval glass and window lead. An articulated canid skeleton was found in the upper part of the fill. Part of the infill of a ghost wall in Area B was excavated. The removal of this material indicated that archaeological deposits are at least 1.5m deep, a remarkable depth of stratigraphy for a rural site. This ghost wall cut through organic material, and the wall was probably removed in the 14th century. The footings of the E wing of the mansion were identified in Area C. This wing appears to pre-date the post-Reformation tower house. It continued in use until it was demolished in the late 18th century. Its rear wall (the easternmost wall of the wing) was removed by the later shrubbery in the NE corner of Area C. Fortunately, the disturbance caused by developing the shrubbery in the late 18th and 19th centuries has not removed earlier medieval deposits in this corner. Prehistoric worked flints were recovered from various parts of the excavation, and it is likely that the medieval site overlies a prehistoric one. Evidence from this year?s work confirms that the bishop's palace in the 14th century was comparable in size and form with the most elaborate examples in other parts of the British Isles. Hitherto such structures have not been identified in Scotland. Sponsors: University of Wales, Lampeter, Society of Antiquaries of London, Society of Antiquaries of Scotland, Aberdeenshire Council, Aberdeen University, Scottish Castle Survey, Alistair Ross of EDS Ltd.
P Z Dransart and N Q Bogdan 1997. Air photograph showing excavations: AAS/97/09/CT. (NJ 723 170) In the July 1998 excavation season, the team drew the N and E elevations of the post-Reformation tower house and mansion, the N and W elevations of the 1818 wing, and the N and W elevations of the 1840s wing. Excavation continued in several areas. A cobbled floor was found, belonging to a structure that lacks entrances, identified as the pit of the medieval bishop's palace. The pit lay at the southern end of a rectangular structure approximately 30.5m (100ft) long, the E wall of which probably extended as far as the rear (northern) wall of the mansion. This wall was widened at its southern end from 1.5m to a total width of 2.6m, indicating that at least part of the building had been heightened. The widening of the wall blocked the outflow of a garderobe into the ditch identified in the 1997 season (Dransart and Bogdan 1997). A second garderobe was included in the outer skin of the thickened wall, and the outflow emptied into the same ditch. This second garderobe was subsequently blocked by large stones. The team continued to excavate the upper, post-medieval contexts of the ditch, which contained large amounts of building demolition. Excavation revealed a continuation of the wall containing the second garderobe, but it had been cut down to permit the development of the shrubbery E of the mansion in the late 18th to early 19th century. A resistivity survey was carried out over an area covering 11m2 immediately N of and SW of the mansion in September 1998. The survey showed an area of low resistance that probably indicates the remains of a robbed-out tower situated at the northern continuation of the wall containing the second garderobe. An estate map of 1838 shows that this building survived into the 19th century. A rectangular structure behind the rear (northern) wall of the mansion and a linear structure running parallel to the rear wall and under the 1818 wing appeared as areas of high resistance. This linear feature may represent the rear wall of a range that was oriented at right angles to the 30.5m long structure noted above. Its front wall was converted into the rear wall of the 17th-century mansion. The survey SW of the mansion revealed an area of high resistance that emerged from underneath the 1840s wing. This may well represent the remains of another tower. As the westernmost part of the 17th-century mansion incorporates the cut-down remains of a barrel vault, it is likely that the medieval bishop's palace had a quadrangular plan, with four ranges of buildings disposed round a courtyard, and that it had towers at the four corners. The 1900 OS map provides possible evidence for a tower at the SE corner, but this area has not yet been excavated. At present, the evidence for a SW tower is more conjectural. The OS map also suggests that the bishop's palace had another courtyard to the S.
Finds from the excavation include a medieval double-sided ?bone comb, two prunts (glass seals) bearing the coat of arms of the Counts Leslie, and the core of a wound rubber golf ball, of a type that dates from after 1901 in Britain. Sponsors: Aberdeenshire Council, University of Wales, Lampeter, Hunter Archaeological Trust, Society of Antiquaries of London, Society of Antiquaries of Scotland, Royal Archaeological Institute, University of Aberdeen, Scottish Castle Survey. (NJ 723 170) Excavation was continued in the main area reported in previous years (DES 1995-98). A garden path was found to follow a curved section in an otherwise straight alignment (NNE-SSW). The straight sections ran parallel with a cut-down medieval wall, the rear wall of a 30.5m long medieval range of buildings identified last year (Dransart and Bogdan 1998). It is evident that this cut-down wall was left as a feature as part of the garden design. The path was perhaps laid in the late 18th or early 19th century. It overlay deposits that were rich in stones, slates and other dumped material. The small finds from these deposits include many fragments and bowls of clay tobacco pipes; bottle glass, including a prunt embossed with the coat of arms of the Counts Leslie; an 18th-century shoe buckle; vessel glass; window glass; tin-glazed pottery; and medieval pottery. Medieval deposits were encountered in a sector W of the cut-down wall. A layer of slates and glazed ceramic roof tiles perhaps represented a collapsed roof that crushed pottery as it fell. In the southern part of the excavation area, the 19th-century excavation trench that was detected and re-excavated last year was explored further. The large dump at its E end contained machine-made Seaton bricks and other building rubble, underneath a pad of mortar. Three internal elevations of the cross-walls inside the standing mansion were drawn. The resistivity survey was extended to the area immediately W of the mansion, the W and E fields in front of the mansion, and the field behind the mansion (to its N). This survey revealed evidence for complex archaeological features dating from different periods. Some of them underlie traces of rig and furrow, aligned approximately N-S. The project directors wish to thank Mrs C Whittall, Mr J Whittall, Mrs C Fyffe, Mr R Fyffe and Mr D Fyffe for their support and for allowing access to the site. Sponsors: BP Amoco, Royal Archaeological Institute, University of Wales, Lampeter, Hunter Archaeological Trust, Russell Trust, Scottish Castle Survey. (NJ 723 170) This was the sixth season of excavation (NMRS NJ71NW 7.01). A medieval residential range running N-S, of which the most southerly undercroft was tentatively identified as the bishop's pit or prison (DES 1998, 6-7), was investigated further by excavating a second undercroft. It contained deposits rich in glazed medieval roof tiles, and a remnant of a wood pad instead of the cobbled floor still in situ in the first undercroft (the 'pit'). A 1.8m wide wall consisting of at least two phases runs N-S below the second undercroft; up to four courses have survived and it latterly served to divide the space within the undercroft. In a new trench (H) opened immediately to the W of the main excavation area, the continuation of a ghost wall (DES 1997, 8) was excavated. It was found to have been reused for the installation of a ceramic drain pipe. S of the ghost wall a section of wall and an internal medieval cobbled floor was uncovered. Deposits rich in medieval finds were also encountered N of the ghost wall, below the level of the 1690s cobbling in front of the ruined mansion. The remains of extensive modern drainage systems were also explored. The line of one of the trenches cut through the main excavation area. Fragments of Venetian glass (vetro a retorti) were found in this trench. A dump of building material was also removed from an area disturbed during the 19th-century excavation of the medieval remains (DES 1995, 31). It contained bricks, lead and plaster. Documentary evidence in the form of a 19th-century plan of the mansion indicated that a 'ditch or moat' had been uncovered when the Regency and Victorian extensions to the mansion were constructed. In Trench J, immediately behind the 16th-century tower house, the uppermost part of a ditch was encountered cut into the natural, running at an angle that would take it underneath the medieval range of buildings. We intend to explore this ditch in future seasons as it appears to pre-date the 13th to 14th-century phases of the bishop's palace and may belong to an earlier ringwork. An extensive resistivity survey was also undertaken in an attempt to define the outermost limits of the site. A series of anomalies were detected in the field immediately N of the mansion. During this year's season two trenches (L and M) were opened up in this field. The rounded gable end of a house 4m wide was uncovered in Trench L. To judge from the size of the stones, the walls were of a turf construction. The long S wall of the house has the character of a field boundary. This structure is comparable with Pitcarmick-type houses in Perthshire, but to date it has not been excavated and there is no evidence for dating. It might date from medieval or post-medieval times. A series of pits cut into natural rock were encountered in Trench M. At present they are best interpreted as the result of quarrying. Sponsors Aberdeenshire Council, British Academy, BP Amoco Exploration, Cannich Archaeological Services, Deeside Field Club, Hunter Archaeological Trust, Miller Plant Hire, Royal Archaeological Institute, Russell Trust, Werkgroep Archeologie 'Philips van Horne', Scottish Castle Survey. (NJ 723 170) Previous resistivity surveys (DES 2000, 9) revealed a series of anomalies in the field immediately to the N of the mansion. During the seventh season of excavation in July and August 2001, our efforts concentrated on cleaning and excavating a series of machine-dug trenches in the N field, as well as extending Trench L, which was hand-dug in 2000. Evidence for plough furrows was detected in Trenches N and P. These furrows were not parallel with the existing field boundaries and must pre-date the early 19th century. The deposits in these trenches have been subject to invasive ploughing in recent times. In the N field the ploughsoil contained eroded sherds of 12th-century AD pottery. To date, the main area excavation in front of the mansion has produced pottery that dates back to the 13th century. Documentary evidence indicates that the Bishops of Aberdeen held lands at Fetternear from at least the 12th century. Two small areas of pebbles were located within Trench N, one of which seemed to be associated with a small burnt area of subsoil. Two fragments of prehistoric pottery were recovered from this trench, and two flints were present in the top fill of a possible pit in Trench P. Trench U cut across a field boundary indicated on the 1838 estate map of Fetternear. It consisted of deep topsoil that overlay natural orange gravel, sand and clay, into which four post-holes were cut, as well as a feature that was interpreted as a post-check. Within the central area of the trench, a depression c 2.8m long NW-SE contained quantities of burnt material, at least 12 lenses of fragmented charcoal, and the burnt remains of more substantial timbers. A stone alignment running approximately NW-SE formed a constructional part of the feature; it is tentatively identified as the remains of a drain or, more probably, part of a flue or rake-out associated with an oven or kiln. Areas of laid pebbles were found N, S and W of this feature. Finds from Trench U include Bronze Age pottery sherds, worked and waste chert and flint. One of the lithics was encountered in a post-hole. Further to the N in Trench U a deposit containing fragments of burnt bone was detected immediately above another area of packed pebbles. Some of the slight features and finds from Trenches N and P appear to compare closely with those from Trench U, and it is possible that the prehistoric settlement was once more extensive. Sponsors: Deeside Field Club, Hunter Archaeological Trust, Brownington Foundation, Mrs Betty Dransart, Mr W and Mrs I Strachan, Scottish Castle Survey. (NJ 723 170) During the eighth season of excavation in July and August 2002, a series of machine-dug trenches in the N field behind the mansion were cleaned and excavated. Previously, a feature in Trench L was interpreted as the possible footings of a house-like structure with a rounded gable end. However, subsequent work has demonstrated that it is an oval feature slumped in towards the centre. It is perhaps a quarry or pit, filled in with stones. The size of these stones suggests garden rather than field clearance. A fragment of sundial encountered among the stones supports such a hypothesis. Trench K also contained a large stone-filled feature, perhaps another pit/quarry. There was evidence of fairly modern soot, domestic and garden rubbish. The activities that produced these remains should perhaps be dated to the early 1900s, corresponding with the remodelling of the late 19th- and early 20th-century shrubbery E of the mansion and bishop's palace (DES 1997, 8). Work also resumed in the main area excavation, immediately in front of the mansion. A substantial depth of medieval walling was uncovered along the N-S trending wall that contained the second latrine (DES 1998, 6). A defensive ditch to the E of the wall underlay a series of 17th- and 18th-century pits containing demolition material. South of the latrine, immediately adjacent to the southernmost reach of the wall, another section of ceramic drainpipe was encountered, inserted in the trench of the 19th-century excavations reported in earlier seasons. Following the tragic and unexpected death of Nicholas Bogdan, in future seasons we are planning to focus the work on this area of the site in his memory. Sponsors: Mr W & Mrs I Strachan, Scottish Castle Survey. P Z Dransart and N Q Bodgan 2002. (NJ 723 170) Excavation continued in the main area in front of the mansion (DES 2002, 8). The ditch and long wall running approximately N-S (see DES 1998, 6) were further explored. In the part of the site that formed the lawn in front of the mansion by the 19th century, it was confirmed that the unpublished excavation carried out in the late 19th century was followed by considerable reconstruction of the long wall and other walls forming 'the pit'. A more slight extension of the long wall, running S, was found to have been constructed over a drainpipe that was probably inserted after the excavation and before the reconstruction work. The 19th-century excavation did not continue into the areas that by then constituted the drive and the shrubbery. The internal face of the long wall (W-facing) was robbed of its facing stones for some length, but a transversal trench across it revealed a very fine face of smaller stones. This wall may have been remodelled to serve as a barmkin contemporary with the tower house. If this were the case, it might have connected with another section of well-faced walling slightly further to the W.
On dismantling a section of the long wall, adjacent to where it was cut through for the insertion of another late 19th-century drain immediately in front of the mansion, 14th-century pottery sherds and roof slates were encountered; one slate had the remains of an iron nail in the hole. This wall had been constructed along the length of the ditch, which, to judge from the paucity of medieval material in the deposits, was recut in post-medieval times. At a later stage the wall was cut down; it then served as the base of footings for more slight walling that formed a wing containing at least two rooms that would have run N-S from the tower house. Finds include an exquisite bone mount of a king, dating from about AD 1300. Sponsors: BP Amoco, Russell Trust. P Z Dransart and W Lindsay 2003. (Classification cited as Moat; Bishop's Palace; Tower-house; Laird's House; Country House; Excavations). The ruins of Fetternear House are situated in parkland about 450m NW of the river Don and 80m NE of the Marshes Burn; it incorporates three main phases of construction, ranging in date from the later 16th century to the 19th century and stands within the moat of the bishop of Aberdeen's medieval palace. Recent excavations by Nick Bogdan and Penny Dransart have revealed the remains of the medieval palace and the moat within which it once stood. Two phases of a large building aligned from NE to SW were located on the inner lip of the SE arm of the moat, the return of which to the NW was found in a excavation trench to the NE of the ruins. A shallow hollow continues the line of the SE arm of the moat to the SW as far as the river-terrace of the Marshes Burn. In addition the foundations of a building that postdates this range and overlay it on the NE immediately S of the ruins, were uncovered. This building comprised two phases each aligned from SE to NW with that to the S built onto the one to the N and offset to the SE (Dransart 2004-5). This building does not appear to be connected with the present ruin, being aligned differently and there are no tuskers in the ruin that would support such a connection. Although the 2nd edition OS 25-inch map depicts the outline of what was recovered by Charles Leslie's excavations in the 19th century (Aberdeenshire 1870, sheet liv SW), these do not match well with those revealed by Bogdan and Dransart and there would appear to have been a good deal of imaginative reconstruction on the part of Charles Leslie. The current programme of excavations by Penny Dransart is continuing, particularly to the W of the track past the ruin. The present ruin appears to be a 19th-century neo-gothic house, comprising a crenellated three-storey building of six bays with turrets and a lower wing at either end. However it incorporates the remains of a 16th century tower-house and a late 17th century laird's house. Two additional ranges of buildings that were added during the course of the 19th century are now part of the ruin. In addition the building once had a large flat-roofed porch that is visible on a 19th century photograph held at the RCAHMS (C65799), which has been completely destroyed as, indeed, has a building depicted on an estate plan of 1838 held by the University of Aberdeen (AUL MS 3528/11) that was attached to the NE corner. The basement of the building incorporates several blocked slit windows, with chamfered arrises and squared heads, which appear to be late medieval in origin, but apart from the one that is visible in the 17th century stairwell and another set in the E wall they are incomplete and cannot be considered to be in situ. That in the stairwell has been made into a feature, and for this reason it is questionable whether it is in situ or has been put there as an antiquarian feature in the same way as the incomplete examples. It is therefore doubtful if any of the standing ruin incorporates walls from the medieval palace. At some point in the late 16th century, the bishop's palace was demolished and replaced by a Renaissance-style tower-house, comprising a range aligned from SE to NW with a hall-house of two floors between two towers, each of them of three floors, the SE of which has a stair turret attached to its SW corner. The stonework along the NE wall does not display any quoins that would suggest that the tower on the SE was freestanding before the first-floor hall was constructed. The roofline of the first-floor hall in the central part of the building is preserved as a groove cut in the stonework of the respective internal walls of the towers at either end. A small window light is visible in the SW gable of the third floor of the SE tower just above the roof-line, the bottom left-hand corner of which has been cut into to make the groove. Holes for the rafters of the hall roof are also visible in the stonework of the turret that is attached to the SW corner of the tower, but no trace of the front wall of the house at this time was evident and it appears to have been completely demolished in the course of later modifications. Only two window-lights could be traced at first floor level in the rear wall of the hall, of which that to the W has been blocked with the insertion of a new chimney-stack in the late 17th century and that to the E is a larger window opening of later date. The tower on the NW incorporates a vaulted basement and domestic accommodation above with direct access via a blocked entrance from the hall at first-floor level. The stair turret on the SW corner of the SE tower provided direct access to the upper floors from the basement and to the hall via an entrance beside the stairs. In its primary phase the basement was lit by slit windows on the SW and SE, both of which have been blocked and there may have been a fireplace at the NE gable that has also been blocked. Whatever the original purpose, in the secondary phase the basement provided the kitchens of the house. The vaulted chamber on the W side of the basement with a deep shallow-arched fireplace against the W wall, lit by small, square windows with chamfered arises to the SW and NE was an insertion. This new chamber was accessed via a vaulted passage leading from the stairs, which also led to the workroom beyond. The narrowing of the SW wall to accommodate the passage is evident with the reworking of the slit-window opening at this point. At the far end of the passage a door led into the larger, better-lit workroom, which had a timber floor above it. It was lit by a square window opening on the NE, which was set in the back of a large press, and on the SW by a slit-window, one side of which is still visible to the SE of a 19th-century opening, and itself replaced the earlier opening referred above. Rearrangement of the upper floors is also evident in the enlargement of windows and the blocking of others, including the insertion of gunports in former window openings. This mansion was thoroughly redesigned in the 1690s as a laird's house, the dates on the armorial suggesting that the work was largely finished by 1693. It is to this period that the creation of the balanced twin turreted structure probably belongs, without the later crenellated superstructure. A matching turret was added on the SE corner of the NW tower and the front wall of the house was rebuilt further to the S, giving a broader interior space, and the rear wall was raised on the existing NE wall to provide a third floor, visible as a narrower construction on the earlier base. The six-bay lighting of the front of the building over a central entrance belongs to this period. It may also be to this period that the unlit cellar ventilated by two small apertures at ground level on either side of the entrance dates, but no access to this could be obtained at the date of survey. At the rear a square stairwell was added that rose the full-height of the heightened three storey-structure. The broken off marble slabs of the cantilevered stair may still be seen, approached via an entrance supported by a heavily weathered red-sandstone lintel in the form of a shallow arch. According to Charles Leslie, there was still a courtyard in front of the house at this stage with a wing on either side framing the space that was closed by a low wall (Leslie 1869, I, 119), but this does not match the archaeology that has been uncovered. This building was converted into a neo-gothic palace in 1818 with the crenellation of the wall-head, using grey granite. At the same time the sash-windows were enlarged by lowering the sill and inserting granite blocks. A new passage was constructed to the W of the stairwell, which gave access to a large bay-windowed room at the rear of the house. In the 1840s a further extension was added to the NW corner, providing two floors of additional accommodation decorated with crow-stepped gables and half-dormers in baronial style. Fetternear was a possession of the bishop of Aberdeen from 1157 (Innes 1845, I, 5-7). Bishop Kyninmund built a palace here in the 1330s, possibly replacing an earlier structure, and it was used as a summer residence by the bishops of Aberdeen (Innes 1845, I, xxviii). The estate of Fetternear passed into the hands of the Leslie's of Balquhain at the Reformation, but had to be redeemed by Count Patrick Leslie in 1690 from the Abercrombies (Bogdan and Dransart 1996, 23). The house continued to be occupied by the Leslies until 1920 when a fire destroyed the building, which is now a dangerous ruin. Visited by RCAHMS (PJD), 14 October 2004 . C N Innes 1845; C Leslie 1869; H G Slade 1974; N Bogdan and P Z Dransart 1996; P Z Dransart 2005. Aberdeen University Library Special Collections, AUL/MS/3528/11. NJ 723 170 Prior to 2005 the focus of excavation concentrated on an area E of the drive leading northwards to the ruined Fetternear mansion and on the field N of the mansion. During the 2005 and 2006 seasons, the team partially excavated an area measuring approximately 25m 2W of the drive. Here it was discovered that the site had been investigated in the 19th century, when upper archaeological remains had been systematically removed in advance of levelling for planting as a lawn in front of the mansion. In the northern part of the excavation, cobbled surfaces and associated large, flat stones showing evidence of repeated heating and metalworking activity were located. Quantities of what are likely to be clay moulds were recovered although no accurate dating from other finds was obtained. At the S end of the site a section of moat was located running grid E-W. Unfortunately it extended southwards beyond the excavation area so its full width could not be ascertained. The recovery of a few pottery sherds indicates that the feature had been in use during the 14th century. Similarly aligned, immediately N of the moat, were two robbed-out walls with a fragmentary stone berm surviving in situ against the southern edge of the more northerly of the two alignments. On the western side of the excavation area there were medieval layers that had not been affected by 19th-century robbing. A section of well preserved timber palisade was found. It was the second of at least three phases of palisaded enclosures, the most recent of which was observed as a robbed-out beam slot from which a sherd of Scarborough Ware was obtained. The surviving section of palisade included reused timbers which will be of dendrochronological interest. The series of palisades was seen to have finally been replaced by a stone wall which is likely to equate with one of the ones already discussed to the E (DES 2004). N of this wall, medieval deposits contained substantial concentrations of pottery, dated 1300-50, and animal bones. To judge from a series of hearths and the remains of an oven (perhaps a bread oven), this part of the site was occupied by the service quarters of the medieval bishop's palace. The westernmost part of this area was cut by a diagonally trending (NW to SE) terraced wall, the W face of which dropped into a ditch. As with the section of moat on the S, we were unable to excavate the full width of the ditch as it extended beyond the area within which we had permission to work. This ditch is probably more recent than the moat and perhaps it served to drain water from the site. Further archaeological investigation is required to confirm whether the bishop's palace was originally moated on four sides, in addition to the section of moat on the E of the site reported in DES 2004. We wish to thank Mrs C Whittall, Mr J Whittall, Mrs C Fyffe, Mr R Fyffe and Mr D Fyffe for their support and for allowing access to the site. Sponsor: Castle Studies Group, Fetternear Trust, University of Liverpool. PZ Dransart and W Lindsay, 2006. Resistivity surveys carried out in association with the archaeological investigations. the area to the E of the drive, which leads to the ruined mansion. Excavation at the southern end of the main area was completed to expose the natural as modified in the post-medieval period. The scarping of this area was reported in previous DES entries. In the course of this work a series of hollowed-out features were uncovered which may represent the remains of wooden structures. The potential structures would help explain why the southern arm of the moat came to an end (DES 2007 and 2008). Further excavation demonstrated that the scarping continued further to the N. In the course of this work a 4.32m long wooden beam was encountered in a beam slot aligned N–S. It has four mortises and bears evidence of carpentry. A preliminary examination by Nigel Nayling identified the beam as the sole plate of a trestle bridge, which probably spanned the moat. This entrance route to the bishop’s palace aligns with the road to the medieval parish kirk of Fetternear (NJ 7332 1752). Finds immediately associated with this feature include 15th-century pottery, animal bones, leather pieces and the fragments of a lathe-turned bowl. The later scarping of the ground has obscured the precise nature of the relationship between the moat and the beam. Interpretation of this relationship may become easier with further excavation to the E but this is likely to be outwith the remit of the current project. A trial trench was excavated S of the main area in order to investigate a hollow earthwork feature running approximately N–S towards the Marshes Burn. This hollow proved to be a continuation of the ditch reported in DES 2008. The upper fills were composed of a large amount of rubble, while the lowest level contained a wall-like structure, the function of which is unknown. This wall has one good face and is overlain by a French drain (detected in section). The profile of this ditch is narrow and flat-bottomed, which may lead us to revisit the interpretation of last year’s description of the feature. The upper fills contained finds of post-medieval date. quality imported 14th-century pottery, which adds to the interpretation of this area as being associated with high status public buildings. These deposits were cut by the robber trench which removed the wall, presumably in the 19th century as it was associated with the installation of a ceramic drainpipe. A number of N–S trending walls have been identified to the N of this wall. The exact relationship of these walls remains to be investigated. Features in this area of the site are close to the late 16th-century tower house and are largely post-medieval in date, but finds include residual medieval pottery. A number of drainage features were discovered, some of which were contemporary with the walling in this sector. Other drainage features cut older walling, indicating a series of occupation phases. allowing access to the site. NJ 7233 1708 The 16th and final excavation season of a project designed to investigate the role of bishops’ palaces in medieval Scotland and their architectural development took place 30 June–2 August 2010. The summer palace of the bishops of Aberdeen at Fetternear was largely surrounded by a moat. The removal of a baulk across the moat close to its SE terminus provided further evidence for posts and postholes belonging to structures mentioned in DES 2007. Another section of the moat was investigated on the E of the site. A 1.94m long wooden beam was uncovered lying where the moat stepped down at its outer edge. The moat was made narrower after the mid-14th century by the construction of a masonry wall which runs N–S on the inside of the moat (DES 2004). This wall seems to have replaced a palisade, evidence for which was detected in 2006 on the SW of the site (DES 2006). contains two chambers of unequal size, the smaller being at the E end. Several complete quarries of medieval window glass suggest that this building had lancet windows. It also had a stone drain, bonded into the lowermost course of the masonry on the downhill (outer) side of the structure. The drain ran in an E–W direction. This building may have served as the chapel or oratory of the bishop’s palace, adding to our earlier interpretation (DES 2003). disturbed. Finds in the deposits overlying this feature included medieval pottery, a slate disc or counter and a jeton. These finds, along with two styli from previous years’ excavations, suggest that this part of the site was where the administration of the bishop’s estate took place. There were also large amounts of animal bone. S of this feature a series of medieval layers were removed down to natural peat. The earliest contained a high proportion of slate fragments, on top of which were laid horizontal slates which were identified by Prof Allan MacInnes as being from Luss or Inchmarnoch, Bute. Finds associated with the post-medieval tower house and the mansion were also recorded amongst rubble dumped in a pit cut into the moat fill at the E of the site. Three chamfered stones of granite were found. They are likely to date from the late 16th century and to have come from a building which formerly stood at 90° to the tower house or from the tower house itself. A highly weathered finial carved from freestone was also recovered from amongst the dumped rubble.